Fornara Eye Center uses some of the newest instruments for diagnosing and monitoring patients eye health. This includes digital retinal camera, IOL Master, Pachometry, Visual Field and OCT. To give our patients the best care we are always updating our technolgy. 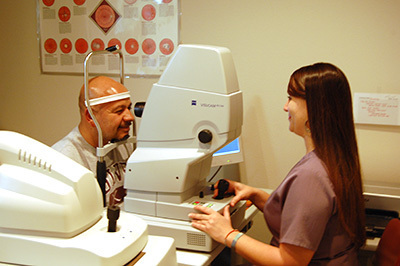 At our clinic we offer specialty testing with our state of the art instruments which can help to diagnose and manage many different eye conditions. The Fundus Photo Camera is a high resolution digital camera that assists with documenting and monitoring the progression of eye disease. Our Visual Fields Instruments provide new, faster and more accurate assessment of peripheral vision. The IOL Master provides us with accurate measurements necessary for correct lens calculations that are used for cataract surgery. The Stratus OCT (Ocular Coherence Tomographer) uses laser imaging that aids in early detection of glaucoma, macular degeneration, and other retinal pathologies. We accept Cash, Personal Checks, Debit Card, Master Card, Visa, and Discover and now Care Credit! We participate with Medicare, United Health Care, Humana, Blue Cross Blue Shield, VSP, Eyemed, Summit, and UMR. We accept most other major insurance carriers as well. Since all insurance policies are different, it is your responsibility to know the requirements and limits of your particular insurance coverage. Call our office for any questions. Check with our staff if you have other types of coverage. We also are a part of Pathfinder Health Provider! All of our staff speaks English and some of our staff speaks Spanish. Our optical boutique carrys over 500 frames for a complete line to fit your needs. This includes economy package selections as well as limited editions and designer lines like Dior, Kate Spade, Kensie, Vera Wang, Bebe and many more. We also carry a complete line of sunglasses, including designer brands like Oakley and Maui Jim. Photochromic Demonstrations: View an instant demonstration of Transitions photochromic technology. See how lenses darken and fade back to clear to provide continual visual comfort and protection. Demonstrations brought to you by Transitions.